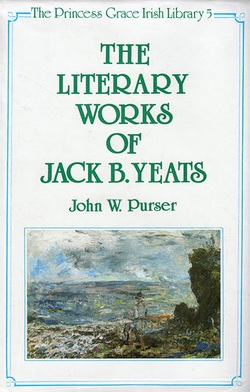 Purser's The Literary Works of Jack B. Yeats was published in 1991 by Colin Smythe and (in the USA) by Barnes & Noble as number 5 in the Princess Grace of Monaco Memorial Irish Library series. Reviews of R.Skelton (Ed.) The Selected Writings of Jack B. Yeats; and the exhibitions Images in Yeats; and Jack B. Yeats: The Late Paintings. In: W.Gould (Ed.) Yeats Annual No.10, Basingstoke 1993. "Voices of the Past: Jack Yeats and Thomas MacGreevy in Conversation" In: W.Gould (Ed.) Yeats Annual No.11, Basingstoke 1995. “Frisky Minds: Jack B. Yeats, Bishop Berkeley and a Soupçon of Beckett”, In: Foley, D., (Ed.) The Only Art of Jack B. Yeats, Dublin 2009, pp.32-39. “Some Stray Personal Thoughts On Yeats And Music, Touching on McIntyre, Burns, MacLean and the Oral Tradition”, In: Foley, D., (Ed.) Yeats 150, Dublin 2016, pp.301-313. “I cannot resist the temptation to close this essay with the fine and compassionate words with which John W. Purser closes his book::” William Murphy, Family Secrets, Syracuse 1995, p.327, n.230, p.467. Review in New Theatre Quarterly, Volume 8, Issue 31, 1992, p.292. “Highly worthwhile book by the great grandnephew of the Irish painter Sarah Purser . . . would be an appropriate acquisition for college and university libraries." Choice.